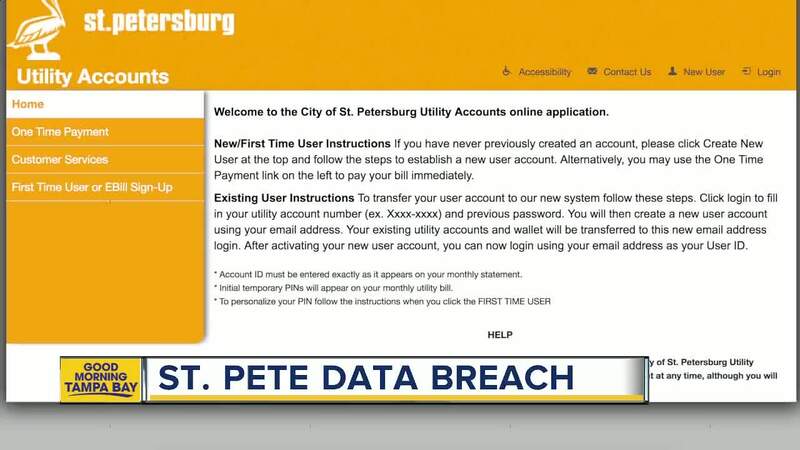 St. Petersburg announced a data breach on Tuesday that occurred between August 11 and September 25. ST. PETERSBURG, Fla. — The City of St. Petersburg announced a data breach on Tuesday that involved customers' credit card information. According to city officials, the City of St. Petersburg utilizes a third-party software product called Click2Gov to provide customers with the ability to pay utility bills, parking tickets, business licenses, building permits, and civil citations online via the Internet. On Thursday, September 27, the Click2Gov vendor informed the city that they had found malicious software on the server. St. Petersburg's payment site was immediately shut down to prevent access. The city says they preserved the existing system for forensic analysis and immediately worked with the vendor to build a new system. By 1:30 p.m. on Friday, September 28, the city had a new system configured and was back in a fully operational mode. The infected system was reviewed by a vendor, specializing in forensic analysis, and their preliminary findings indicate that the Click2Gov pages used to accept credit card information had been breached. The breach only affected users of the online Click2Gov system who made payments for utility bills, parking tickets, business licenses, building permits, or civil citations by credit card between Aug 11, 2018 and Sept 25, 2018. Any payments made in person, via the phone system, via E-Check or to any other city systems were not impacted. As a first step, the City of St. Petersburg recommends that you closely monitor your financial accounts and if you see any unauthorized activity, promptly contact your financial institution. They also suggest that you submit a complaint with the Federal Trade Commission by calling 1 (877) 438-8228 (1-877-IDTHEFT) or online by clicking here . As a second step, you may want to contact the three U.S. credit reporting agencies (Equifax, Experian, and TransUnion) to obtain a free credit report from each by calling 1 (877) 322-8228 or by logging onto www.annualcreditreport.com . If you feel you’ve been a victim of identity theft, you should file a police report with your local law enforcement agency. If you live in St. Petersburg, call St. Petersburg Police at 727-893-7780 to file a report over the phone. You can also do it online, go to www.police.stpete.org and scroll down and click on the eagle link. "We sincerely apologize for the inconvenience this incident has caused you. This notice has not been delayed for the purpose of completing an investigation in this matter, and we will keep you informed of any developments in the investigation that may be of importance to you," the City of St. Petersburg wrote in a press release. Click here for a full timeline of events related to the data breach.